Does your perfectly vintage bathing suit need another touch of flair, or is your beach-party look not quite earthy enough to hint at your hippie roots? These barefoot sandals are the answer! Earthy festival fashion in Peacock theme, they’re adorned with tassels and turquoise gemstone beads – j..
On the cutting edge of style – but soft and romantic with an heirloom touch, these crocheted lace barefoot sandals are just right for the Bohemian girl. For outdoor weddings from the beach to the family farm, these sweet sandals make walking barefoot in the grass a sensual pleasure with a love.. They can be worn barefoot or with shoes. Unique design. One size fits all. 100% cotton yarn Please convo me if you have any special requests for a different color. Handmade and shipped from a SMOKE FREE / PET FREE HOME Care: hand wash - lay flat to dry. .. These adorable barefoot sandals can be worn barefoot or with shoes. Hand crocheted and beaded with high quality czech beading, gemstones, feather and silver finish accents. Perfect for a festival, destination wedding or just for a barefoot day! Unique designed by BARMINE. Please do not co.. These romantic Butterfly barefoot sandals with Pearl beads accent can be worn barefoot or with shoes. You may want them for your bridesmaids, for your reception, or just enjoying a barefoot walk. Unique designed by BARMINE. Please do not copy! One size fits all. 100% cotton yarn Plea.. 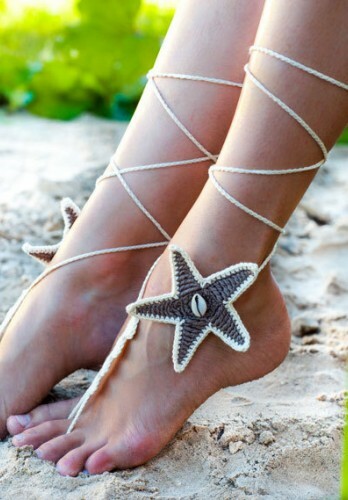 These wonderful Barefoot sandals made in starfish shape with real seashell can be worn barefoot or with shoes. Just perfect for your beach wedding! I can make them in CORAL or AUQUA or pure WHITE to match your wedding colors. You may want them for your bridesmaids, for your reception, or to wear en..
New barefoot sandal style in Brown! You may want them for your bridesmaids, for your reception, or to wear en route to your honeymoon. These are perfect for yoga classes, bellydance or just walking barefoot on the beach. They can be worn barefoot or with shoes. One size fits al..
New design of the barefoot sandals in Turquoise with double tie around the ankle. Looks very hot. Gorgeous as a "gift for her". They can be worn barefoot or with shoes. Gift packaging included. Unique designed by BARMINE. Please do not copy! One size fits all. 100% cotton yarn Car..